I’m just kidding. 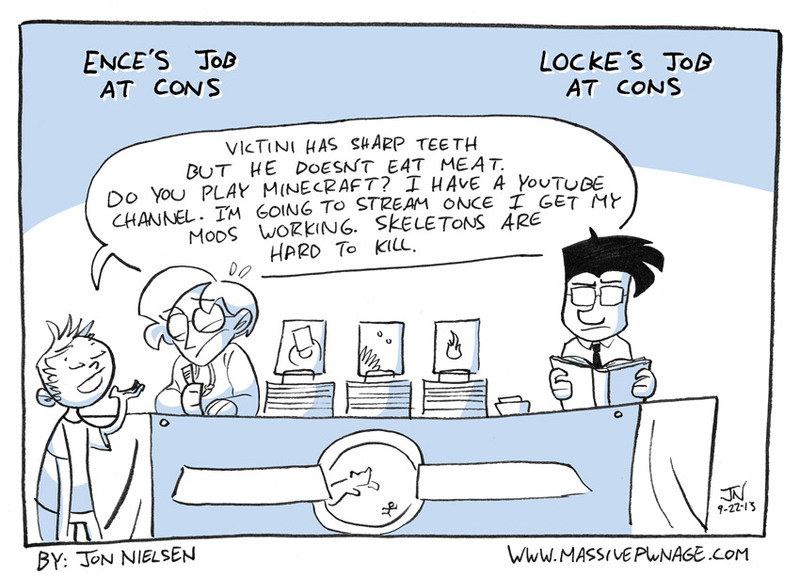 As I found out this weekend, it’s actually very difficult to achieve full con potential without a Locke there. He’s what you’d call a “people person.” I’m just kidding about the kid, too. He just had a lot to say and not enough time to say it. Also, the fact that he was wearing a Victini shirt made drawing Victini a whole lot easier. Thanks kid! There’s not really a whole lot to say about the con other than that. We sold some books, drew some pictures, met some fans, and even met Kris Straub (he’s a very tall man) and Erika Moen (often NSFW!) All around a pretty rad weekend! This entry was posted on Monday, September 23rd, 2013 at 12:00 am and is filed under Comics. You can follow any responses to this entry through the RSS 2.0 feed. Both comments and pings are currently closed. You finally get to touch Kris’s beard? Nah, he shook my hand though. Next best thing! That’s a common side effect. It’s not me though. Promise. And thanks for reading!